"We are just so happy to go through," said Belgium captain Hazard, who was the man of the match in Rostov, as his side set up a quarter-final against Brazil in Kazan on Friday. "To be fair, we were thinking it was like two years ago against Wales," said Hazard. "But we have players who can change the game and they came off the bench to make the difference." "During the first half we were quite good, but things went wrong at the start of the second half, both goals were avoidable, but the reaction we showed was great," said Hazard. The victory emphatically answered any questions about the Belgians' fighting spirit. "These are the type of matches we need, so we are all very happy," Hazard added. "It's going to be magnificent playing against Brazil and we need to rest and regenerate." Chadli's superbly worked goal in the fourth minute of stoppage time was the final act of an epic last-16 battle. "In the first 60 minutes, we were a little roughed up by the Japanese, who were very well-prepared for our tactics," said Belgium's match-winner Chadli. "We started to win our duels and showed that we had more desire than them." "It (his goal) was like a dream. The coach made the changes because he wanted more power in the middle and we managed to bring that. "When I was warming up (to come on), I saw the Japanese were tiring. "It was important to avoid extra-time. "Brazil are a big team, we've seen them play, we have to rest, focus on the next game. There is not much time." 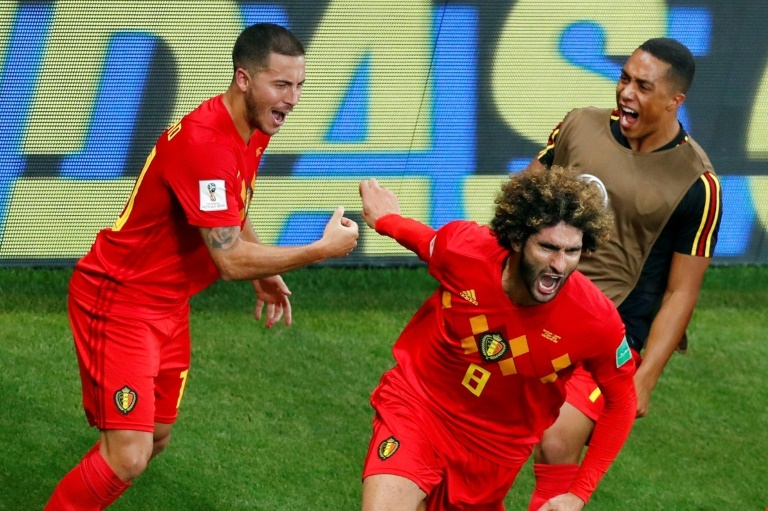 Fellaini, who scored their second less than nine minutes after coming on, said Belgium earned the reward for their never-say-die spirit. "It was an important game for us because we showed the mentality, we come back from 2-0 and scored three goals in 90 minutes," said Fellaini, who has just signed a contract extension with Manchester United. "It will be tough against Brazil, we know their quality, so it's going to be a good test. "We are more mature than before and we all want to show what we can do against Brazil."